It was not just a walk – it was part sashay, part glide, part pose. It was a dance. On fashion runways, the Walk was done in stilettos, in flats, barefoot, tiptoe. It was done for fashion's kings, masters, critics, merchants, slaves. The Walk was praised, copied, admired. It became the walk of a decade. It became a song. It became a trademark. And it was named after the world's first Asian supermodel, the Filipina Anna Bayle, who triumphed in the 1980s and 1990s as a catwalk goddess on the most acclaimed runways in the world. Anna Bayle walked for every single fashion designer who mattered, from Hong Kong to Paris to New York. Yet, the Anna Bayle Walk was not just a fashion trend. It was not just a breeze that blew through. It was the lifelong march of a determined woman who achieved absolute success. Yes, women – all women – must learn how to walk. Perhaps they must crawl at first, and true, they will stumble, they will fall, they may even be pushed aside. But a woman who has learned how to truly walk, her own way, head up high, her soul shooting up her spine, is a woman who has learned how to live, how to love, how to give, how to choose. She has learned how to balance herself. A woman who can call a walk her own is a woman who has come to know herself, and love herself. And even after the runways and red carpets and flashing bulbs have gone away, even when the applause has faded, even when no one is watching, the Walk goes on, through life, on the streets and alleys, on the pavement, through beaches and parks, through triumph and tragedy, through joy and sorrow; to this day, still, always, Anna Bayle just keeps on walking. Madame Figaro celebrates art de vivre, joie de vivre, and the privilege of being a woman, so this is the focus of the article. What has modeling taught you about being a woman? about life? As a woman, modeling has taught me how to ‘know my worth’. What I mean is that women go through their lives and loves letting situations happen to them. As women, perhaps at some time or another, they were rejected or they were passed off and other people were chosen instead of them. What I learned in modeling is that sometimes rejection does not really reflect on you but on the person who rejected you. For instance, if you are Asian and you go to a casting and everyone (editor, photographer, director, etc) loves you for the part but the client is specifically looking for a blond Caucasian and you do not get the commercial. This does not mean that you are not good enough for the part. It only means that for their commercial purposes, they needed something else which you could never fulfill. The same goes in affairs of the heart. Just because a man has chosen someone else before you, reflects on his choices and not necessarily on you or your worth. Over the years, I have learned that people make individual choices and the most important thing, as a woman and as a model is that I know that I am worth it. If they don’t see it …it is really their loss. As for what modeling has taught me about life, I have now come to a conclusion that in life, one must really dream it and want it, to be able to acquire it. It was only when I went for it, and consciously thought that I could be a very successful model,…. did I, indeed, become a successful model. In life, I believe it is important to have dreams. It is important sometimes to take a moment and think about all the things we want to be. And when you have determined what it is that you really want to be, then your subconscious helps you make the right decisions towards this goal. You are intelligent, articulate and you have amazing depth - which goes against the usual model stereotype! How have you cultivated this throughout your life? 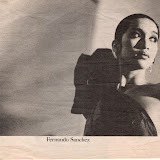 The supermodels I encountered during my time were really intelligent. I do not think one could get to the top without that. It takes a lot of commandeering one’s career to reach the top. For instance, Cindy Crawford was a valedictorian. I have always been a scholar. In kindergarten, I was the valedictorian. Coming from a family of 7 brothers and sisters, I thought that I had to compete for love and attention. I strove hard to get more gold medals and honors than my over-achieving sisters throughout grade school. Then, without my parents knowing, I took an entrance exam for Philippine Science High School, which was a government program of accelerated education aimed at training the young brainiacs to be scientists. Out of thousands from all over the country who took the exam, only 150 were chosen. At 13, I had a stipend and was being paid to study. When I started college, I was offered 2 more scholarships to the University of the Philippines, also after taking exams that were given to thousands. When I became a model around my 3rd year of college, my mother lamented that I was throwing away my life; she begged that I go back to school fulltime. At that time in my life, I had already understood the importance of being independent, of being self-supporting. Modeling was paying for a lot of things – the most important of which was, freedom. And I did not want to give that up. Finally, when all her friends would send clippings of me from all over the globe, she relented and just nagged me about my weight. When one has a background of excellence in academics, it does not just go away because one is now jet-setting. I was not even the best student at the Science school and the university; I believed I was in the bottom of the barrel beside my uber-intelligent classmates. However, the thought processes stay with you all throughout your life. They say that a human being acquires 95% of his or her intelligence by age 7. 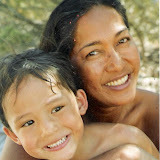 As a mother, I surrounded my son with a lot of love. I invested a lot of time and effort to be beside him while he is growing up and I tried to expose him to anything that will develop his intelligence and give him all the skills to prepare him for living his own life. As for cultivating being articulate and having depth, I read a lot. My father told me once that, if I ever was depressed or sad…he said just read books. I might not experience everything in life but just reading about other people’s experiences, gives me an insight into everyday situations and emotions that I would never get the chance to. Perhaps by informing myself, I will have the tools to tackle anything thrown at me. The lowest points of your modeling career. The highest. The highest points of my modeling career were whenever I walk down the runway and hundreds of people applaud simultaneously and call my name out loud and some are shouting “Bravo, Anna”. It is a very intense feeling when one is in front a live audience and one feels so adored. Sometimes, after the couture shows, I would walk in an exclusive restaurant with another model in Rome, and the clientele would applaud when we walk in. It feels very redeeming that your artistry is noticed by people who are 'in the know'. The lowest points were of course when I first started modeling. I call them the ‘lean years’; when I decided to leave the comfort of being in Asia to try my luck in the international fashion capitals of the world. I remember eating only a spring roll each day for a week when I first arrived in Paris because it was the only thing I could afford (5 francs and 40 centimes) and the only familiar food I can point at behind glass counters because I did not speak a word of French then. I remember falling asleep in parks in London and Paris waiting for the appointed times of my go-sees; that is, instead of going home in the metro just to go back to the same area again. It really hurt me inside not to be able to get what I wanted at that particularly ‘down’ moment but when I came back to New York and I had already made it, I made it a point to have fresh huge bouquets of flowers in every room in my Park Avenue apartment changed every week. 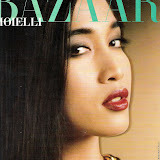 You have rightly deserved the title World's First Asian supermodel. Tell us what it was like to make it at a time when standards of beauty were predominantly blonde, buxom and white. When I first moved to New York, the covers of the magazines then were Cheryl Tiegs, Christy Brinkley, Renne Russo and Andy McDowell. It was very difficult to enter the New York fashion scene. I was hired immediately by a top modeling agency but was not getting any editorials or designer jobs that would propel me to the top. And when I lost my job at Maximilian Furs, I had no choice but to head for Europe. The same friend who stopped me from buying the flowers (Luigi Javier) also said to me, “Just go to Paris and do not come back to New York until you are a star.” It was the point of no return in my career. It was ‘make or break’ time. It seemed that New York was a closed door to me. New York was a fashion capital that only wanted proven professionals. I did go to Europe –first stop Milan, where my agent told me that there was no work for me. And I took my last money that I saved and took a train ride to Paris. I even checked into a hotel where I only had the money for one night but told them I would stay for the week. The French fashion people are very different; they want to discover beauties. Their idea of beauty is also quite different. When Thierry Mugler hired me for my first and only press show, I was immediately plucked from obscurity and put beside the big stars – Jerry Hall, Pat Cleveland, Marie Helvin. Sometimes, people want to see the stars and sometimes, people are also intrigued by unknowns and would like to see more of them. I was able to break that “blond and buxomly’ mold because I was really “non-specific”. One could not tell by my looks where I was from – I could have been American Indian, Brazilian, Chinese, Latino, Black, Japanese. I was more of a chameleon and was able to fit in with whatever look the fashion designer required. Before I knew it, the fashion cognoscenti were calling me “The look of the 80's” because I was in all the big fashion press shows in Milan and Paris. The 80’s was the era of the popular television show ‘Dynasty’ - of big shoulder pads and powerful women. It was a time when women were making their mark in the corporate world; striving and succeeding in a purely masculine environment. I think that my success was more of an attitude rather than a look. Fashion is always a sign of the times and I was in the right place and the right time to be noticed. After 4 years of living in Paris, I returned to New York. I was now a proven professional and a star and this time, all doors were open. Sometimes, the best path is not the direct path. Sometimes, one has to make detours along the road to reach one’s destination. Tell us again about how you came up with the Anna Bayle walk. As a model, it is important to be unique. To copy how every other model walks is simply to be a robot or a clothes hanger. I wanted people to notice me. Over time I developed my own style – which is walking on tip-toes. Even with flat shoes or barefoot, I would stand on my toes and sashay down the runway. One cannot be anything but oneself and if you try to pretend, people watching are not convinced. Instead of forgetting my roots, I tried to embrace them and bring them out from within me. Sometimes when you portray something that is intrinsically yours; something that nobody else can give – then you are able to distance yourself from the crowd and stand out. I always remembered the washer women from my country, the Philippines. They would wash their clothes in the river and when they were done, they would balance their wash load on their heads. They had to cross the river, stepping on wet stones, barefoot. They were light on their feet and always had pointed toes in order not to get wet or fall from the slippery surfaces. This was a picture I always had in my head. It is a beautiful paradoxical picture of elegance and simplicity. This image in my head is was what I incorporated in my walk. Fashion has changed from what it was during your time. Tell us honestly what you think of fashion and modeling today. I think success is a process. I honestly believe that if a person gives something or someone, good energy – then that person will get it back. So whatever we put our minds to, and we apply ourselves or we give it all we have –I would consider that a success. If every day is a good day, no matter what you choose to do, then cumulatively…you will find, you are a success. I urge all women who can have children to have at least one. If you can’t, then adopt one. I know this to be a secret among mothers. Now, I know what mothers all around the world were referring to when they have that knowing look in their eyes and they say “You’ll see. It’s different.” When women know that they would do anything, sacrifice all, and give up everything for another human being - it is love at its purest and it is very fulfilling. Most important thing you learned from living in Hong Kong. In Paris. In New York. About MEN. Just share with us anything you want to impart about love and relationships! When I was much younger, I have had my share of long standing relationships and it was good to be with someone you can grow with. However, as a model meeting men for the first time, it was hard to determine whether they were with you because of your looks or because of you. And yes, Paula, it is a privilege to be a woman. I love men and always will! But now that I have a son, I seem to look at them with more compassion than I had before. It might be a simplistic way to think, but I see men as being kids once - vulnerable and wanting of love and attention. I believe that men’s capacity to love is taught to them by their mothers. So, we, women must teach our children how to love. As for marriage, I want to say, “Marriage is great…if it works.” Sometimes it doesn’t. I am happy to say, there is only one man in my life. And it is Coca-Cola…THE REAL THING. He is my son, Callum. What are you looking forward to at this stage in your life? At this stage of my life, I am looking forward to guiding and equipping my son with all the good values in life that will help him to succeed in his life. I look forward to falling in love again. I look forward to meeting my soul mate. I would like to meet a man who will love me; I would like him to be someone I will love. My son is on his way to independence and at this time, it would be great to have a companion for life, as single motherhood is very isolating. I already have a child and my gardening days are not here yet. So, I look forward to writing a book. Vogue China invited an international coterie of guests to celebrate their third year of its existence. The iconic magazine flew in celebrities from all around the world to give salute to an iconic city - Beijing and an iconic year for China – 2008, in light of the recent success of the Beijing Olympics. Vogue Icons was also a celebration of Vogue magazine’s 116-year old legacy. The glamorous night of icons and icon makers was held at the Park Hyatt Ballroom. The impressive guest list was a cross-section of East and West, fashion and film, society and celebrity. The red carpet featured the president of CondeNast Asia - James Woolhouse, Chinese actress Maggie Cheung, Japanese soccer player Hidetoshi Nakata, Nina Ricci’s artistic director Olivier Theyskens, movie director Oliver Stone, supermodels headed by Kate Moss, Du Juan, Jessica Stam, Sasha Pivovarova. Even global icons Mickey Mouse and Minnie Mouse donned the glamour in Chinese-inspired outfits designed by Vivienne Tam. The multi-media program for the evening was an exercise in celebrating the past with the present. The first part defined the iconic status of Vogue magazine with its 116 years of existence. French film actress Lou Doillon, daughter of Jane Birkins of the ‘Birkins bag’ fame took to the stage to talk about what makes an icon. Then Candy Pratts Price, editor-in-chief of Style.com presented an award to Kate Moss for her 20 years in fashion. After which, Angelica Cheung, editorial director of Vogue China, applauded the work of Mario Sorrenti, the fashion photographer as an icon maker and China’s very own supermodel, Du Juan. 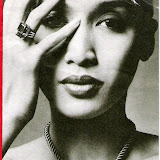 Anna Bayle, the first Asian supermodel, paid homage to one of the greatest fashion icons, legendary Yves St. Laurent. The audience remembered the fashion master’s artistry in reverent silence while they watched curtained screens spanning the length of the ballroom drop from the ceiling, playing images of Monsieur St. Laurent at work in his atelier. Roland Mouret, London based designer, introduced Jennifer Woo of Lane Crawford. The Lane Crawford brand is known to bring international fashion to China. Philip Lim, a new generation Chinese designer, talked about his first Vogue moment. Olivier Theyskens, artistic director of Nina Ricci, introduced China’s beloved icon, film actress Maggie Chung, known for her role in "In The Mood For Love". The dinner came to a satisfying halt after model-actress, Milla Jovovich showed another one of her talents by regaling the glamorous crowd with two songs. After which all the guests were transported to a celebration after-party at the Legation Quarters which was the site of the old American Embassy beside the Tiananmen Square. The lavish fashion event, organized by Melvin Chua of the Ink Pak Communication Group, was a feat that can rival any gala fete in the Western world. In collaboration with Vogue personnel, Chua orchestrated a 4-day affair of festivities for the international guests. There were limousined tours to the Forbidden City, the Summer Palace, the Great Wall and various museums and silk markets in the heart of Beijing. There were dinners at the exclusive China Club and Aman Resort at the Summer Palace. If the elaborate and elegant Vogue Icons fete is any indication of what China can offer to the international fashion scene after the spectacular and unmatched Beijing Olympics, then we better brace ourselves for what is yet to come. China is on route in the Silk Road of fashion.